Rhonda is using Smore newsletters to spread the word online. Learning division can be easy! Watch the video below about dividing with remainders. Please click on the link to answer the questions. 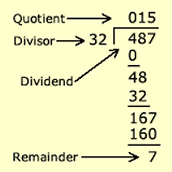 Once you are finished with the questions, click on the link below and read the article about division with remainders. Now you will work to practice the skill. Go to the two links below and complete the activities. Practice a division game on the website below. Practice division facts with remainders. On the website below, choose level 6 and complete 10 problems. Use paper to work out the problems if needed..
Free! Practice your Addition, Subtraction, Mutliplication and Division - self-marking Online exercises and worksheets with answers, you create and print from your browser. Set your level of difficulty. In your math journal, explain this picture. How does it relate to multiplication, division and remainders?